For the 8-bit Scrap Brain Zone, see Scrap Brain Zone (8-bit). For the Sonic Drift racetrack, see Scrap Brain (Sonic Drift). 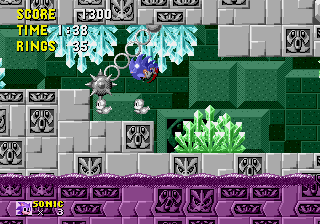 Scrap Brain Zone is the sixth zone in the 16-bit version of Sonic the Hedgehog. It is a trap-filled industrial level with much dangerous machinery such as saws, flame vents, and disappearing and rotating platforms. 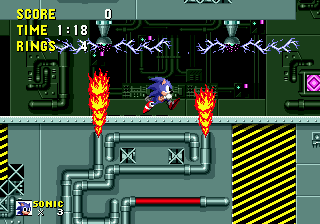 At the end of Act 2, Dr. Robotnik appears behind a force field and pushes a button which sends Sonic into Act 3. This is a level similar to the Labyrinth Zone and has no encounter with Robotnik. Instead, it leads directly to the Final Zone. 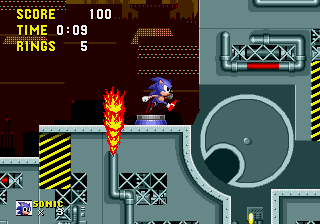 All throughout this zone, it is not possible to enter the Special Stage as the giant rings that lead to it never appear. This is because part of the VRAM area normally used by the big ring is used by the animated smoke in the BG. A big ring can be added by hand, but it will use garbled tiles whenever the smoke animates. Originally, Scrap Brain Zone was named "Clock Work Zone", displayed as "Clock ork Zone" on the title card due to the lack of a letter W in the used font. Caterkiller - Their body is protected by spikes. Jump on its head to avoid taking damage. Bomb - Mindless kamikaze bomb bots that walk back and forth along a short plane, either on the ground or ceiling. Ton-ton - Pig bots that hop in place atop steep banks and roll balls down the slope. This page was last edited on 10 August 2018, at 08:43.